Glitter netting ruffle & trim at waist, glitter & black netting layered below knees to create "tail"
...this Girl's Skeleton Mermaid Costume is just how a gorgeous mermaid might ring in the spooky season. Pretty cool, right? We know! 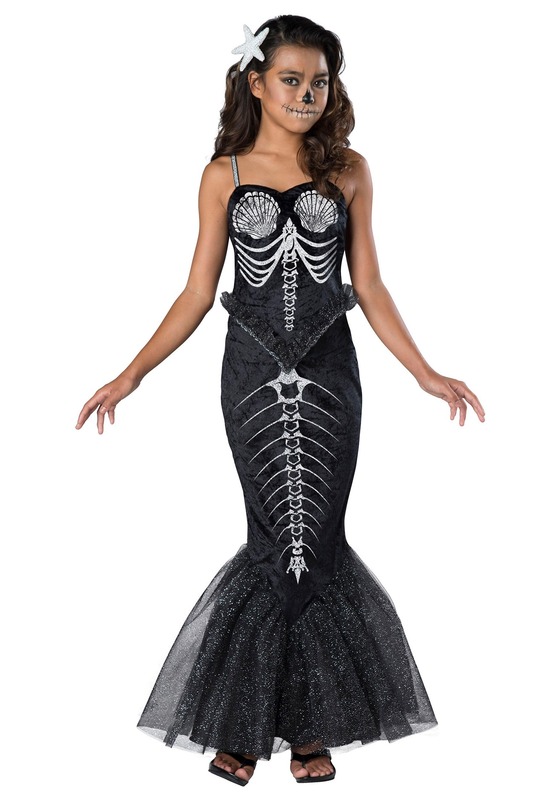 Skeletons are apparently a really common part of mermaid lore (according to a few translations that have been found in sunken ships), so it's no surprise that this costume takes on a shimmery skeletal style. But somehow, this little mergirl is still really beautiful—even without the colorful shimmer of her tail. So, if your little gal likes the idea of having a true mermaid's Halloween, this costume is the perfect mix of eerie and ethereal to help her celebrate just like her merfriends down deep! This costume is bound to bring out the dark side of you darling mermaid, but in a totally great way! Not only is this dress-up look eerily pretty, but it's also fun to wear. It's a velvety, fitted black gown that flares at the bottom hem with tulle, mimicking a tail. A cool, skeleton bone print adorns the front of the dress, while a tulle peplum creates even more flare at the hips. Sparkly straps add just a hint of elegance to this skeletal look—she is a mermaid after all! Add hair accessories, face paint, or even a black trick-or-treating bucket for a pulled together look that's totally how a mermaid would do Halloween up right! Now we know how cool a mermaid Halloween is, we really want to see it for ourselves. Do you think your girl could get us an invite? We've got a great idea for a skeleton dolphin costume, and we bet we'd come back with some amazing stories!